Recently published research studies showcase progress in the development of vaccine candidates designed to induce powerful antibodies against HIV. Why is curing HIV such a daunting task? Only one person has ever been cured of HIV. This person, Timothy Brown, also known as the “Berlin patient,” did not reach this point easily. Brown received two stem cell transplants from donors with a genetic anomaly that makes their cells resistant to HIV infection in addition to multiple rounds of cancer treatments aimed to cure him of leukemia. This hardly represents a viable strategy for curing HIV. In fact, researchers are currently lowering their expectations for the sort of HIV cure that might be feasible. Rather than a traditional cure, which would require every bit of HIV be flushed out of the body, researchers are focusing now on what is more akin to a long-term remission that would enable HIV-infected individuals to go for some extended period of time without requiring the continuous antiretroviral therapy (ART), which so effectively controls HIV infection. One of the biggest obstacles to an HIV cure and the reason HIV persists in the body even during therapy is something called the viral reservoir. This is the term researchers use to describe the pool of long-lived resting cells in the body that harbor HIV. If at any time ART is interrupted, these cells can awaken and begin actively producing virus. Researchers do not know exactly how the viral reservoir is formed but assume that it likely begins, at least in part, soon after HIV enters the body and begins infecting immune cells known as CD4+ T cells. These immune cells are the preferred targets of HIV. Some CD4+ T cells may become infected by HIV just as they are about to transition from an active state to a resting or latent state in the body. 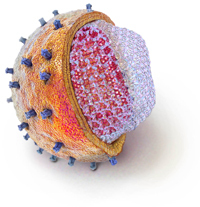 Once latent, these cells do not actively replicate or produce copies of HIV. As a result they are invisible to the immune system, and impervious to the effects of ART. As part of current efforts to cure HIV, researchers are trying to better understand how the viral reservoir is established, exactly what types of cells constitute the reservoir, where these cells are in the body, and how best to awaken and decimate these cells. While researchers don’t fully understand how the reservoir of latent HIV-infected cells is established, they do know it happens with startling speed. Studies in monkeys indicate the viral reservoir is established within days of exposure to the monkey equivalent of HIV. The case of the “Mississippi baby” suggests the viral reservoir may also be established quickly in humans. In 2010 a baby born to an HIV-infected mother received ART beginning just 30 hours after birth, even before medical staff had confirmed the baby’s HIV infection status. After a month, researchers could not detect any HIV in the infant and therefore stopped ART. After two years the child remained HIV-free, firing hopes that a cure was achieved. But last summer the child’s virus rebounded and treatment was resumed. This case suggests that even starting treatment within the first two days was not enough to prevent establishment of the viral reservoir. Researchers widely agree that CD4+ T cells are the basis of the viral reservoir. But there are also other types of long-lived cells that may harbor HIV and researchers are now trying to determine where these viral hideouts may be. It is possible the reservoir is spread throughout tissues, organs, and fluids, including in the lymph nodes, heart, lungs, spleen, brain, gut, or even within bones and the spinal cord. Researchers currently have few options, none of them very reliable or comprehensive, for how to thoroughly measure the reservoir or determine exactly where it is. They are also hindered by the difficulty in collecting tissue samples. Being able to map out the reservoir and measure it would be useful to researchers trying to test ways to reduce or even eliminate it. Overall, the viral reservoir may be relatively small: perhaps fewer than 10 million cells in an infected person. But in this case size may not matter. Scientists can grow enough virus from one single latently infected cell within two weeks to be able to detect HIV using standard tests. A sterilizing cure for HIV may therefore require eliminating every single cell of the viral reservoir, something researchers say is incredible daunting. The ultimate goal of understanding the viral reservoir is finding ways to reduce or ultimately eliminate it. One strategy for doing so is called “shock and kill” or “kick and kill.” The idea is to use some agent—perhaps an anti-cancer compound or a genetically altered stem cell—to wake up latent HIV-infected cells and then kill them. Some kill strategies include using ART in combination with therapeutic vaccines or by directly administering anti-HIV proteins, known as broadly neutralizing antibodies, that are currently a crux of preventive vaccine research (see Spotlight, this issue). Several strategies for draining the viral reservoir are under investigation and others will soon be tested in clinical trials. But because there is no reliable way to measure the extent of the reservoir, the only way to currently tell if these strategies are effective is to interrupt ART and see what happens.